What might be regarded as the golden age of the suburban cinema was, with hindsight, rather short-lived, in fact barely fifty years. Moston joined in with its own trio, not counting the Princess (Conran Street) and Victory (Capstan Street), which strictly speaking were in Harpurhey and Blackley respectively, though not far from Moston Lane. The three Moston cinemas are mentioned below, in order of opening date. Opened as a theatre and music hall, with occasional film showings, on Hartley Street, off Moston Lane. An advert in ‘The Stage’ of 7 July 1910 announces “Vulcaris and his Speciality Piano Entertainment” appearing for two weeks, with “Humorous Songs and Excellent Sketches”. The following year saw the “Three Sisters Godfrey, Vocalists and Acrobatic Dancers”. After being acquired by Fred Severs of Little Lever, the MIP was refurbished, extended and reopened as a purpose-built cinema on 29 May 1916. It had a 22ft screen and seated 925. Six years later it became a limited company under directors Eliza Preston and W.H.Simcock. A friend and neighbour, Carole Gausden, has an early memory of seeing “Mandy”, with Jack Hawkins, one summer’s evening in the 1950s. The last film shown was “The Cruel Sea” (also starring Jack Hawkins) in 1959, after which the owners stripped out the seats and converted the building into an indoor market (they themselves had a carpet stall), in which form it will be remembered by many. More recently, it has become one large food hall, with the main entrance on Pym Street, and now renamed “Moston Superstore”. 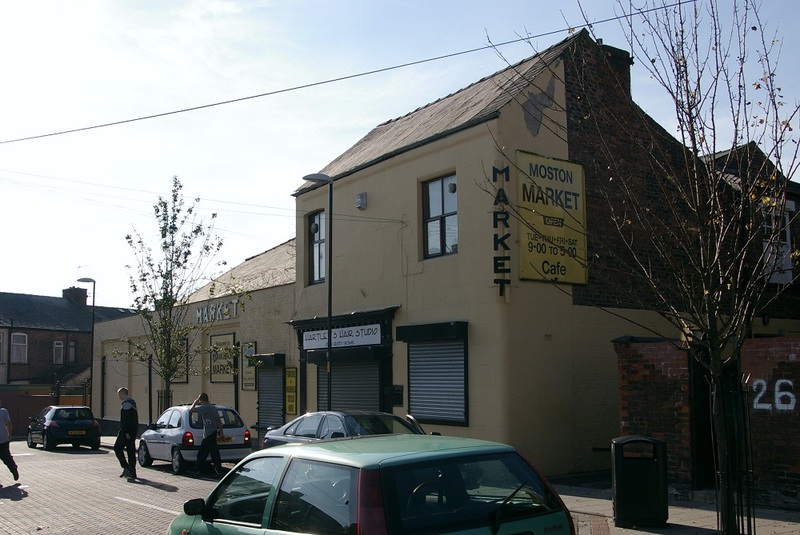 The well-known MIP Market, Hartley Street, in October 2007. So far, no photos of the MIP as a cinema have come to light. A tin hut named the Empress was opened on what was then Dean Lane (now Kenyon Lane) around 1914. 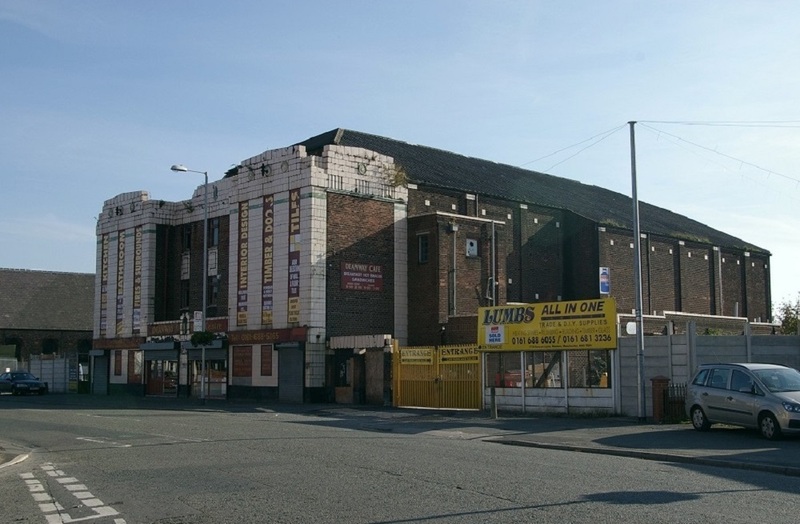 It is not clear whether the Empress was renamed or replaced, but by 1918 Vincent Tildsley was disposing of the “Adelphi Cinema, which he ran at Moston”. At that time it could accommodate an audience of 900. A year later the company went into liquidation and changed hands several times up to 1932. The Adelphi in 2007, as Deanway DIY, on Kenyon Lane (originally part of Dean Lane, through to Oldham Road, Newton Heath). By 1937, having been acquired by H.D.Moorhouse, a brand-new building was opened, seating 1312 and with a 36ft wide proscenium. In this form it lasted until 1962, when it became a bingo hall. After this closed, despite some fire damage while it stood empty, it was taken over by Deanway DIY, who still own it and whose manager very kindly allowed me to look round and take interior photos. The seating ranks and much of the original decorative plasterwork are still intact. 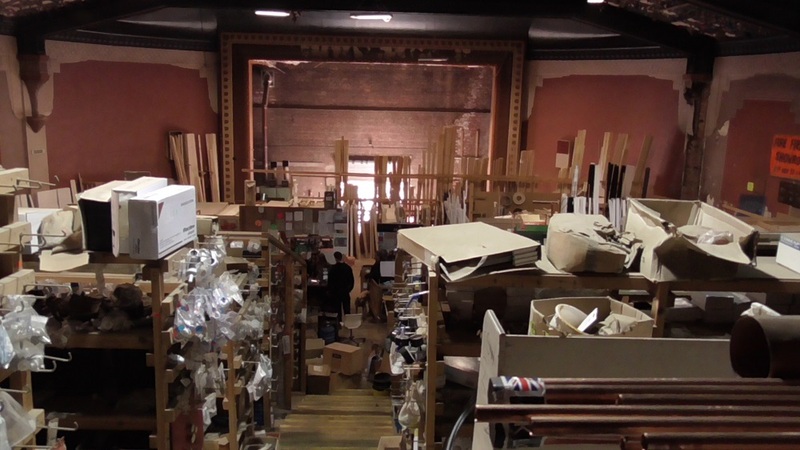 Inside the Adelphi in 2019, looking from the back row towards the screen, still quite recognisable as a former cinema. The “Four Ways”, as originally styled, opened on 17 October 1939 with a screening of “Submarine Patrol” starring George Bancroft and Richard Greene. 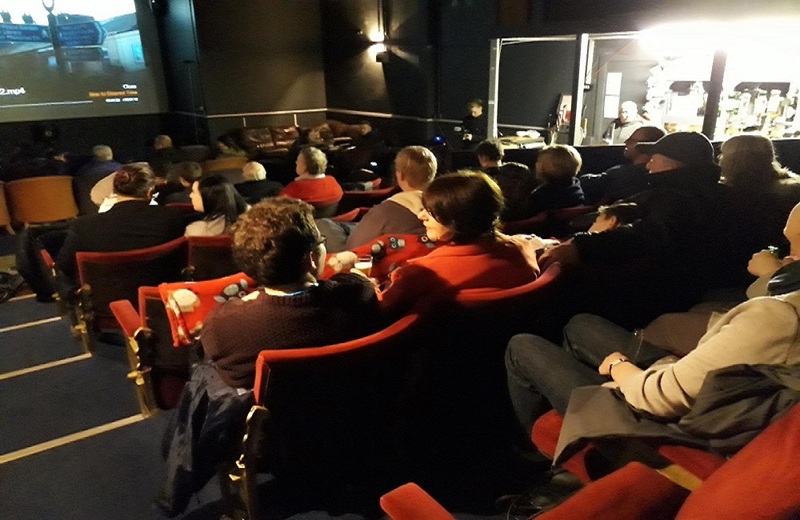 Located at the junction of three roads, Moston Lane, Charlestown Road and Chain Bar, locals said the “fourth way” was into the cinema itself, but this may have been tongue-in-cheek. It had 1256 seats, a screen 38ft wide and was the only one of the three that I visited, as a cinema. The Fourways, from Chain Bar, in 1959. Inset: a similar view sixty years later. My grandparents, Fred & Emily Booth, worked at the Fourways in the early 1960’s. 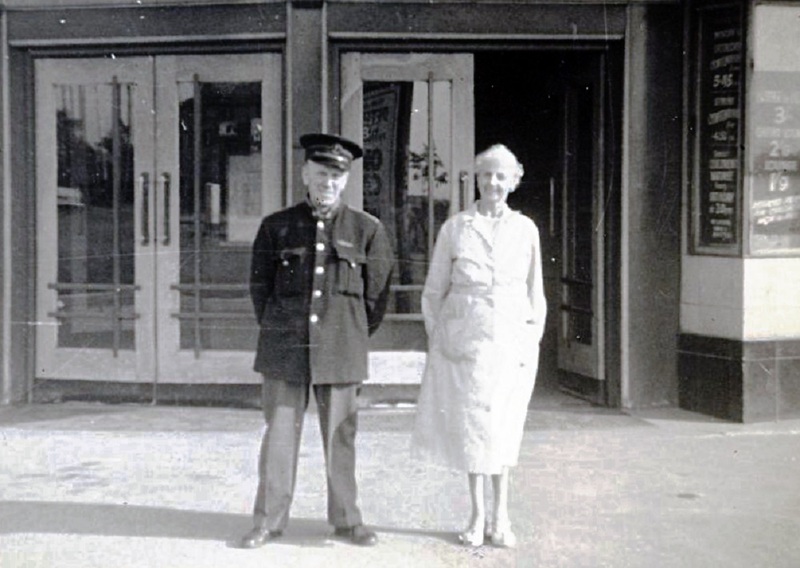 Emily was an Usherette, evenings only, checking tickets, showing people to their seats and taking a turn with the ice cream and popcorn tray, while Fred was the Fireman, caretaker, handyman and Jack-of-all-trades. The box office and projection room had their own staff. I once spent a day with my Grandad, helping him out. His first job was to stoke the coke-fired heating boilers, then clean out the seating area, which was usually littered with cigarette packets and dimps, empty ice cream tubs, toffee papers and popcorn bags! He would also do any repairs needed, such as replacing damaged seats or changing lightbulbs. Another job was putting up posters and pictures in the display outside, for any new films being advertised. In the evenings he would don his Fireman’s uniform and keep an eye on things generally. He was only 5’6” but he would not be messed about. He was known as “Fiery Fred” and if anyone misbehaved he would frog-march them to the door by the scruff of the neck and throw them out, no matter how big they were! ‘Fiery Fred’ and his wife, Emily, outside the Fourways entrance in 1962 [Photo by Steve Wilson]. 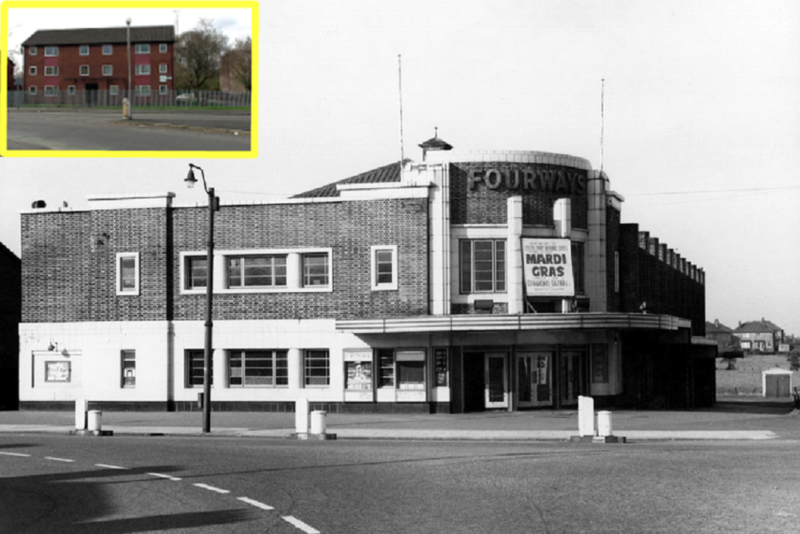 The Fourways lasted until November 1973, the last main feature being “Live and Let Die” with Roger Moore, but unlike the other venues it was demolished soon afterwards and replaced by flats named “Fourways Walk”.